Break-neck dungeoneering with 1 hit point! 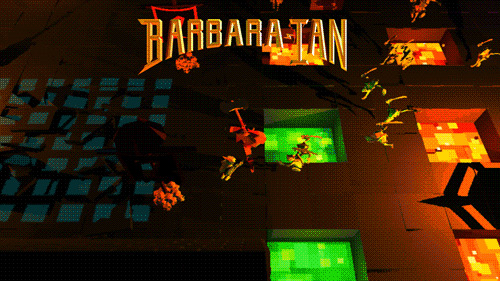 Barbara-ian is a dungeon crawler focused on pure action. It's levels use a procedural generation system to make sure you never face the same challenge twice. The gameplay is focused on marauding through dungeons smashing everything in your path - doors, tombs, gelatinous cubes etc. A physics-based combat system makes the smashing deeply satisfying. 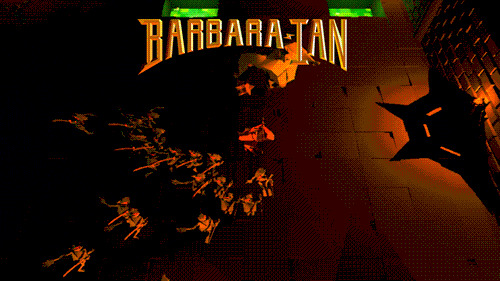 Finding chests is your primary objective, smash them and collect the weapons inside to progress deeper into dungeonland. Fast and frantic gameplay that blasts the cobwebs off all the old RPG tropes! Our unique process of level generation means you never face the same challenge twice! Meaty, deeply satisfying, physics-based combat! An abstract first-person physics platformer which has you survive in a variety of environments against forces beyond your control that are tearing the world apart. Play it for free HERE! Env's dynamic environments are in a constant state of deterioration, and represent a unique gaming challenge. Pick out a precarious existence as mysterious architecture crumbles around you, at the hands of an unknown entity. Explore a vast array of environments, all in a state of collapse. Will they take you down with them?